You don’t have to look far to see that the landscape of education is changing. Schools everywhere are struggling to keep up with emerging trends in technology and to leverage new tools such as internet-connected tablets. Evidenced by Apple’s recent announcement of iBooks 2 with fully interactive textbooks, tablets offer a range of capabilities that can make learning not only engaging but also fun. 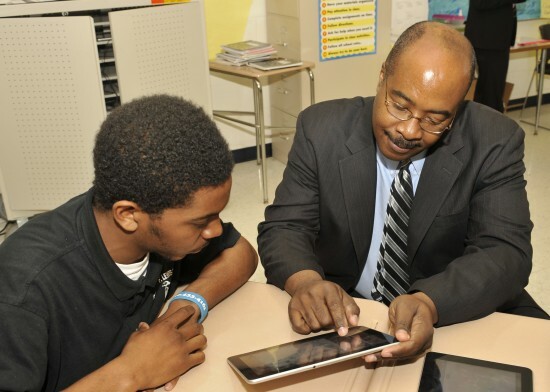 Dr. Barney Wilson, principal of Baltimore’s Reginald F. Lewis High School, sees the potential these new devices offer, calling them “game-changers” for education. Thanks to his enthusiasm for such technologies and with the aid of Verizon Wireless, the students at Reginald F. Lewis are getting an inside track on preparation for the SAT. 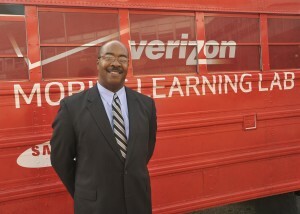 Since the beginning of the new school year, Verizon has been deploying its Mobile Learning Lab, a retrofitted bus stocked with 4G LTE-connected Samsung Galaxy Tabs and staffed by students from nearby Morgan State College, to Reginald F. Lewis. The Galaxy Tabs come pre-installed with apps such as Study Island, a suite of educational tools geared towards a particular state or city’s school system and standards, to take their studying to the next level. Not only are students excited to get their hands on the high-powered Android devices, but Verizon points to data that shows a link between mobile learning devices (tablets and smartphones) and greater academic proficiency. At Reginald F. Lewis, the link between technology and academic achievement goes beyond the Mobile Learning Lab and into the classroom, where Verizon again has supplied the high school with Galaxy Tab devices for use in Spanish classes from the beginner level through advanced placement. Students can interact with the tablets to help better understand the language in a way that would not be possible otherwise. The tablet won’t replace practice with a native speaker of the Spanish language, but the real time feedback it provides is invaluable to students. 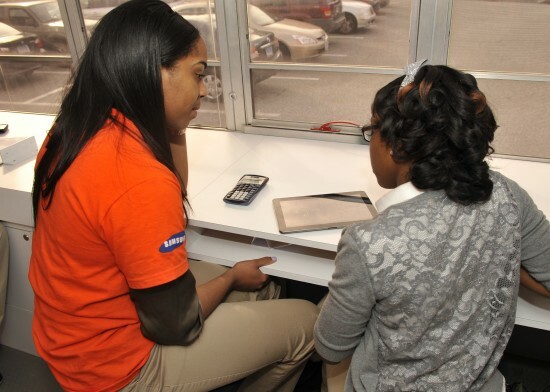 Reginald F. Lewis isn’t the only school to benefit from Verizon’s Mobile Learning Lab and the power of the Samsung Galaxy Tab. Other Baltimore-area high schools have worked with the wireless provider to help students prepare for their standardized tests. Big Red’s bus makes frequent visits to schools throughout the Maryland and Washington DC metro region as well as nationwide. It’s a strong commitment to education on Verizon’s part and the sort of program we’d like to see expanded to more and more schools. Not only are students preparing to take the next steps in their academic lives, but they are doing so while using the tools that will reshape the face of education.